W. Harvey J. Unga (’10) greets fans after last year’s Homecoming win. It’s tradition. 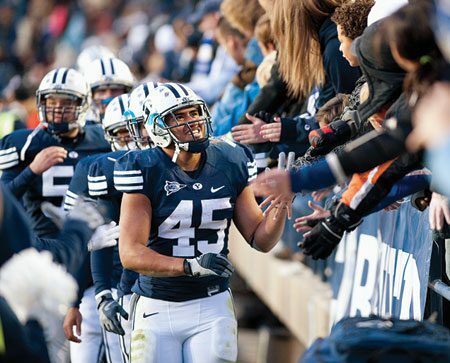 Every fall BYU invites alumni and friends to join students for a â€¨ spirited week of activities. BYU Homecoming 2009, scheduled for Oct. 20–24, will begin with opening ceremonies that reflect the 2009 theme, Reach for the Summit. 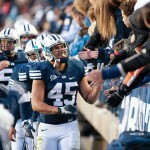 That Marriott Center event will launch five days of activities, including a Mr. BYU talent contest, tailgate parties, dances, 5K and fun runs, a pancake breakfast, a parade, a hike up Y Mountain, a Spectacular showcase in the Marriott Center, and the football game against TCU. Additionally, various reunions are scheduled throughout campus. The week will highlight cheerleaders, the Cougar Marching Band, honored college alumni (who will give lectures Oct. 23), and recipients of university awards. The week is also designed to honor a founder whose considerable contributions played a role in building the Spirit of the Y. The 2009 founder, Eugene L. Roberts (AB 1916), was BYU’s first athletic director and a man who ushered in many traditions, including calling the athletes Cougars.